Adventist Health System’s partnership with Bio-Optronics is an exemplar precedent underlining the expansion of clinical trial management system industry. Recently inked, this agreement encompassed the initial roll-out of the Clinical Conductor CTMS at two of AHS’s research institutes, along with a CTMS-EMR integration with Cerner Millennium that will apparently enhance the process efficiency and offer streamlined clinical trials as per patient requirement. Bio-Optronics, with its AHS alliance, is certain to consolidate its position in clinical trial management system industry. In an era of surging healthcare costs, an increased force of attention has been drawn on customized medication, drug development, and patient comfort. Clinical trial management system market, once characterized by sponsor convenience and feasibility, is now slated for a revolutionary transformation, given the increased costs associated with expensive trials. As per estimates, global spending on medication has been forecast to hit USD 1.3 trillion by 2018. Despite an elevated expenditure, patient needs seem to have been virtually unmet, which has resulted in the need for a patient-centric approach – a need that has now gravitated into an emerging trend of CTMS industry. Heavily deployed by pharma firms, web-based, cloud-based, and on-premise clinical trial management systems enable efficient control with regards to data retrieval, data transfer, and internal data transfer. A CTMS market report compiled by Global Market Insights, Inc., claims this business to accrue a valuation of more than USD 2 billion by 2024. Outlined below are four major trends that have been projected by experts to make a ground-breaking impact on clinical trial management system industry in the ensuing years. eClinical systems are on a rage lately, with pharma firms concentrating on the research module, handing over the technical aspects to the experts. These companies have already been reeling under the pressure of escalated drug costs and massive drug consumption. At this juncture, it would seem more convenient for these firms to focus on their core competencies and outsource the hassle of clinical trials to external firms. Outsourcing, as on the advent of the new millennium, has been touted as a rather smart and innovative way of conducting business, as it enables companies to acquire the benefits of the outsourcing operations in addition to consolidating their costs. Most entrants and SMBs finding their niche in clinical trial management system market have been observed to adopt this approach, which has contributed to reshaping the dynamics of CTMS market. Outsourcing critical R&D operations has already kicked ground in clinical trial management system industry – while smaller vendors have been providing an appreciable service portfolio, bigger multinationals have now penetrated the business. Clinical trial management system market is sure to witness a dynamic transformation, with companies outsourcing services such as clinical trial planning and management, study design, bio-statistical analysis, preclinical evaluations, and independent safety data monitoring. A recent example of this trend is that of Bioclinica, a renowned CTMS industry player, releasing a new clinical trial management system that can be used for smaller organizations. The proliferation of big data is one of the biggest technological revolutions witnessed in the 21st century. Clinical trials necessitate the storage of huge data piles, which is termed to be one of biggest challenges faced by pharma companies since a long, long time. The forthcoming years will have clinical trial management system industry witnessing a barrage of big data analytics approaches, which will contribute toward the integration of data management, data security, data collection, and data repository – all under one platform. Through this business approach, companies operating in CTMS market and by extension, the overall pharma sector, will have formed an efficient repository that will enable data accessibility for analysis, simulation, modeling, and pooling, in addition to standardizing the norms that will need to be enforced and complied with, with regards to this rather efficient data athenaeum. Experts claim this approach to be a long-term one, and rather far-fetched, however, the benefits will be out there for everyone to see. The enforcement of big data analytics is one absolutely metamorphic trend that is chronicled to bring about a change in the dynamics of clinical trial management system industry, considering that this trend will effectuate the simplification of data reconciliation, safety, and analysis. The Internet of Things has cast its spell on almost every industry, clinical trial management system market being no exception. The IoT debut has led to the genesis of electronic records across major sectors – of late, CTMS industry players have been endorsing paperless archiving on a huge scale, pertaining to infusing efficiency, accuracy, and precision in clinical trials, which is likely to become a full-fledged convention in the subsequent years. Furthermore, IoT advocates two major tendencies that will gain precedence in CTMS market in future – mHealth and wearables. The usage of mobile phones has increased manifold in the past decade, and the device is no longer merely an entertainment outlet, but is extensively used for sharing, compiling, and acting upon health-related information posted online. An mHealth market report compiled by Global Market Insights claims this business sphere to exceed USD 60 billion by 2023, which is a sure-shot indicator of how much CTMS industry is likely to be impacted by this sector. Mobile messaging and notifications are being adopted massively by pharma firms to recruit a wider patient base and keep them abreast of the clinical trials. What’s more, mobile apps are likely to be used on an extensive basis, for reminders about drug induction timings, sharing information, appointments, site visits, and more. This in turn, will enhance a study’s outcome and enable a more efficient clinical trial with improved quality and compliance, driving CTMS market. A research study states that mobile platforms reduce trial costs and increase patient recruitment by 30% - another factor that will augment the CTMS industry. Wearables ensure that the device is with the patient all the time, enabling CTMS industry firms to get a better idea of patient data, simplifying clinical trial processes. Sanofi’s Verkko trial for a 3G-enabled wireless blood glucose monitor is a remarkable instance of the same. The estimate that wearable devices market may cross USD 12 billion by 2023 only serves to strengthen the predictions underlined for CTMS industry. As already mentioned, enhanced patient empowerment is becoming the mantra of CTMS market players. The modern-day patients are well-informed and have the access to numerous technological devices, which has prompted pharma companies to increasingly incorporate them in clinical trials. As per a reliable study, this tactic is affirmed to reduce the costs of clinical trials by several notches. A 2016 study claims average clinical trial costs of all three trial phases to be around USD 340 million, a tremendously huge expense, which may be reduced with a patient-centric approach. The implementation of patient-driven strategies, as per experts is likely to speed up patient enrollment, enhance drug study designs, and empower patients to take crucial decisions, which may have a sizable impact on CTMS market. Technology companies have been manufacturing tools that enable direct patient engagement, helping them keep track of periodic alerts and improving their quality of life through support group discussions and the like. Through these tools, the communication channels between patient-to-provider, patient-to-sites, and patient-to-patient have become incredibly simple. 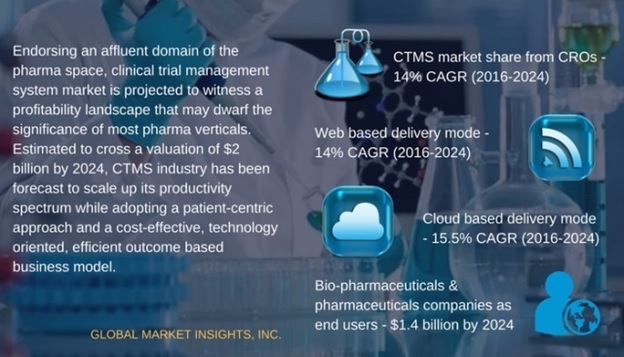 With a massive patient engagement rate through all phases of clinical trials, CTMS industry is likely to carve out a lucrative growth map over the years ahead. Adopting an efficient outcome-based risk-monitoring model ensures a cost-effective clinical trial, thereby helping to leverage CTMS industry expansion. The utilization of resources while acknowledging potential risks helps to reduce the amount of data wastage and increase the flexibility of the existing data pools, indirectly contributing to patient safety. Clinical trial management system market is also remnant of many other trends, such as that of evidence-based medicine, eSignatures, and the famous Lean Startup methodology that enumerates an efficient, scientific approach to manage clinical trial innovation and satisfy patient needs with utmost efficacy. All in all, it can be inferred that these emerging trends in CTMS industry solely tread toward one desideratum – that of enhancing the accuracy, preciseness, and speed of clinical research activities at lowered costs. An all-effective, all-inclusive, integrated approach is certain to bring about this revolutionary change, which, in more ways than one, will lead clinical trial management system market size to scale unbelievable heights, having registered a valuation of more than USD 750 million in 2015.